It was great to see the Lick Run project for himself, he said, as well as talk with EPA scientists who are helping evaluate MSD’s efforts. The project is designed to help solve a problem Cincinnati shares with many cities whose older sewer systems collect rainwater and also sewage from households and businesses. During a heavy rain, the water overwhelms capacity at sewage treatment plants, causing overflows into nearby waterways. Lick Run is actually 12 stormwater management projects intended to reduce 400 million gallons of combined sewer overflows annually by collecting rainwater and moving it directly to Mill Creek. Its central feature is the Lick Run Greenway, a mile-long bioengineered waterway in South Fairmount to be built from spring 2017 to December 2018. It’s part of a larger solution, with an estimated cost of $244 million in 2006 dollars, that will mix green projects such as wetlands or rain gardens with new storm sewers in an effort to eliminate nearly two billion gallons of combined sewer overflows into Mill Creek every year. 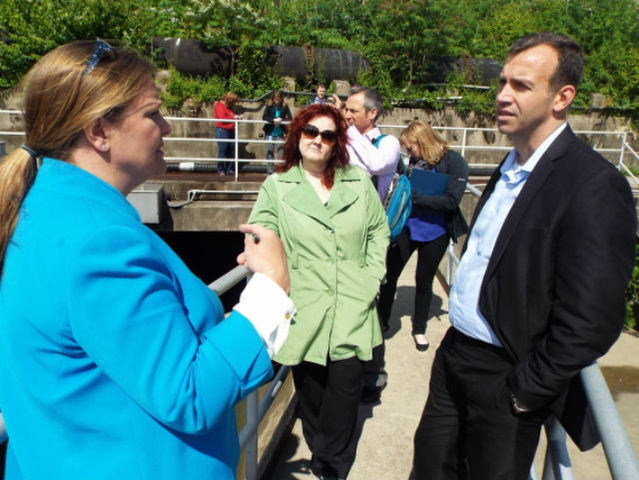 As he visited one of the largest sites where overflows happen, Beauvais questioned deputy MSD Director MaryLynn Lodor about the costs of the mixed green/traditional solution versus a traditional solution. She replied that the traditional solution, at $414 million, would have been more expensive. The traditional solution, which would have involved building a large tunnel to carry stormwater, would also have been less flexible, something MSD needs to keep in mind as storms become more severe. MSD can always add more rain gardens or other green projects, she said, but would be a lot more difficult to make a tunnel wider once it’s in the ground. 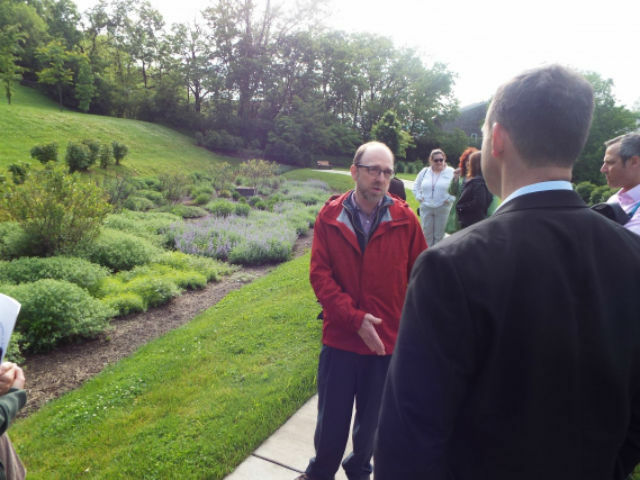 The first stop on the tour was one of MSD’s first green projects, a rain garden created in 2010 from a former parking lot at St. Francis Court Apartments, 1860 Queen City Ave. Here, gardens of native plants and shrubs, plus engineered piping, catch rain that runs down a hill toward the street. Beauvais discussed the nuts and bolts of the St. Francis project with Scott Jacobs, a physical scientist at the Cincinnati EPA lab who’s studying its effectiveness. He’s usually there collecting water samples when it’s raining, he said, not on a sunny day like Wednesday. The garden does a great job keeping water out of sewers – about 400,000 gallons a year, Lodor said. But Jacobs is still studying how well it absorbs nutrients that make their way to the Gulf of Mexico, where they can create dead zones in the water. Good-looking projects like this also create great community amenities, Beauvais said, which in many cities become springboards for development and attracting businesses. MSD is surely hoping that will happen with its creation of the Lick Run Greenway, for which MSD has purchased 91 properties, some of them blighted or vacant. The latter include 1608 Queen City Ave., a former laundromat that Beauvais also toured on Wednesday. It’s being taken apart by Building Value, a subsidiary of Easter Seals Tri-State that does green demolition and reuse of the material it removes. Another local nonprofit, LawnLife, will keep the property clean until construction. Building Value provides on-the-job experience for workers with barriers to employment, and LawnLife hires “at-risk” youth. One would probably not see that kind of side, social benefit on a traditional sewer project, Beauvais said. On Tuesday, Beauvais visited the EPA lab at 26 Martin Luther King Drive, the second-largest EPA lab in the nation and home to some of the agency’s top water quality scientists, who have worked on disasters as diverse as the Deepwater Horizon oil spill in the Gulf of Mexico in 2010 and last year’s algae bloom on the Ohio River. He said he spent the day talking about research the lab’s scientists they were doing to support the EPA’s drinking water work around the country. But he also participated in a roundtable discussion with members of Confluence, a water technology innovation group that EPA hopes can create and commercialize water technologies that solve environmental challenges. It was exciting for him, he said, to see the role that the EPA had played in bringing that group together, which includes local financiers, business leaders and water utility representatives, as well as scientists. “We absolutely recognize that technological innovation is critical to move toward sustainability,” he said.